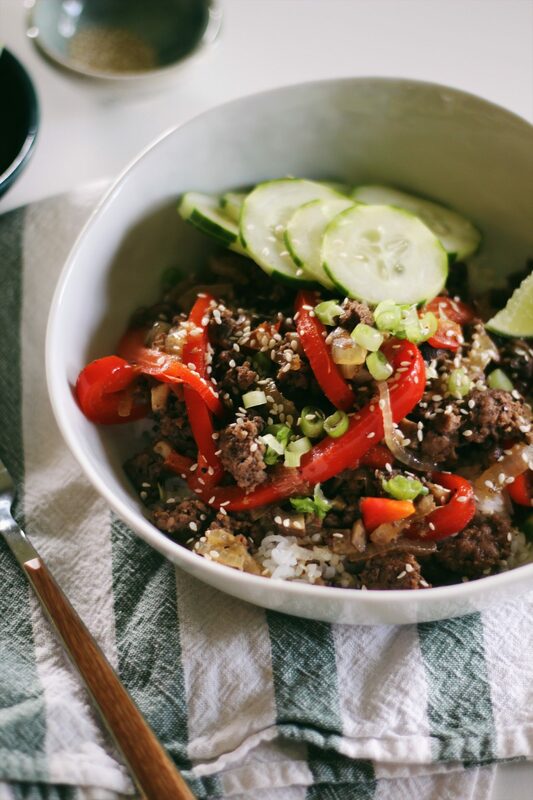 These Healthier Korean Beef Bowls are loaded with vegetables and laced in an addictive sweet-and-spicy sauce. They’re also incredibly easy, coming together in under 30 minutes start to finish. Thank you to the Mushroom Council for sponsoring this post. Make the pledge to be a blenditarian and share what drives you to do better! When we lived in Portland, we had this great field and park right behind our apartment complex. On the weekends, the field would host different soccer games and there would be food trucks there. I neither played nor knew someone who played soccer, but I would mosey on down to the field anyway and pretend I did. Just for the food trucks. My favorite food truck that set up shop there was this Korean BBQ truck. I would cross my fingers on Saturdays and hope they were there that day, and not the boring hot dog stand (no offense, hot dog stand). As I made my way down the apartment complex’s stairs, I could see the field from the large floor-to-ceiling windows. Each time I could see the very top of that bright, aqua green food truck from behind the tall trees, parked in a grassy corner, I got excited. They’re here today! I’m getting tacos. My favorite item on their menu was the Bulgogi Beef Taco. Bulgogi beef has a delicious and addictive sweet-and-spicy flavor, accented by salty soy, nutty sesame oil, and ginger. Sometimes bulgogi has grated apple or pear in it, brown sugar, gochugaru or crushed peppers, or a variety of additions. Here, I keep these Korean Beef Bowls easy. So easy. 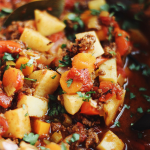 First, I use ground beef which makes this dish come together quickly with minimal effort. Second, I create a tasty sauce from items you probably already have in your pantry: honey, dark brown sugar, soy sauce, sesame oil, etc. Third, I make these Korean Beef Bowls a tad bit healthier. We do this by adding plenty of fiber-rich and delicious veggies. There’s onions and bell peppers, which add some sweetness to the dish. There’s crisp cucumbers for crunch. And we use equal parts ground beef and finely chopped mushrooms as our beef mixture. I love doing this for multiple reasons and you’ve probably noticed me doing it a lot lately. 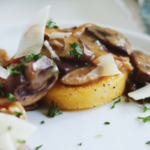 I’ve used this half-mushroom, half-beef method to make Whole30 Portobello Burgers, Beef Stroganoff Stuffed Mushrooms, and Hearty Salisbury Steak Chili. So, why do this? I’m so glad you asked! 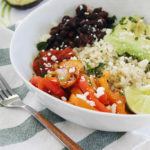 This method is called Blenditarian, a really fun word for a really delicious and healthier way of eating. 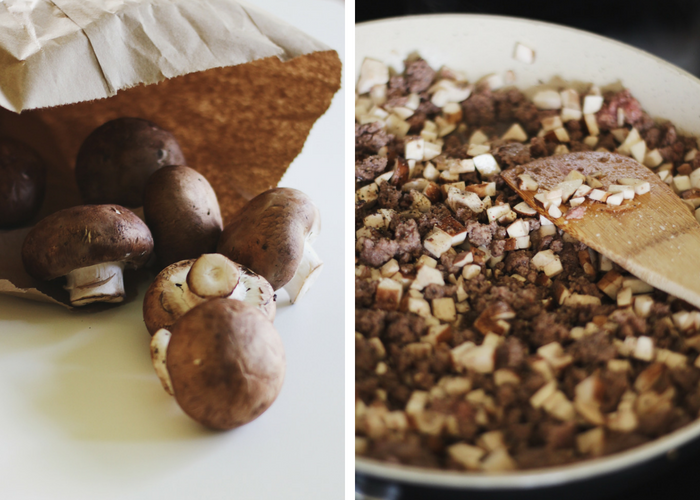 You simply chop your mushrooms to match the consistency of ground beef, blend, and cook. Whether you’re making burgers, chili, or stuffing bell peppers, this is a delicious way to incorporate more veggies. It creates a balanced meal that is also better for your health and better for the environment. Win win! Cooking Blenditarian trims the fat, cuts the calories, adds a serving of veggies (never a bad thing! ), and is cost-effective and sustainable. One million mushrooms can grow in just an acre of space, require minimal water, and are one of the most renewable crops around. Plus, mushrooms are fat-free, cholesterol-free, and rich in nutrients, vitamin D, B vitamins, antioxidants, and potassium. 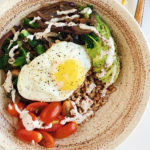 Mushrooms make for delicious, meaty, and healthier Korean Beef Bowls when paired with grass-fed, organic ground beef. Let’s dig in. 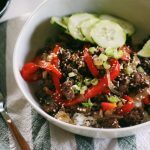 I hope that you make and enjoy these Healthier Korean Beef Bowls! What are your favorite quick and easy recipes? Let us know in the comments below! Make the Pledge to be a Blenditarian and share what drives you to do better. Plus, take the monthly Blenditarian Challenge and you could win $250! 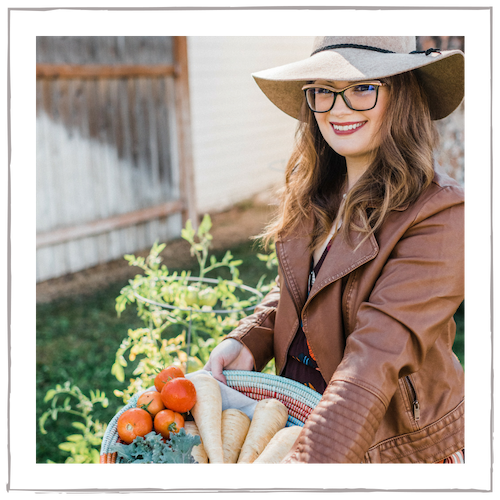 This post contains affiliate links and are always products I love, highly recommend & use in my own kitchen. 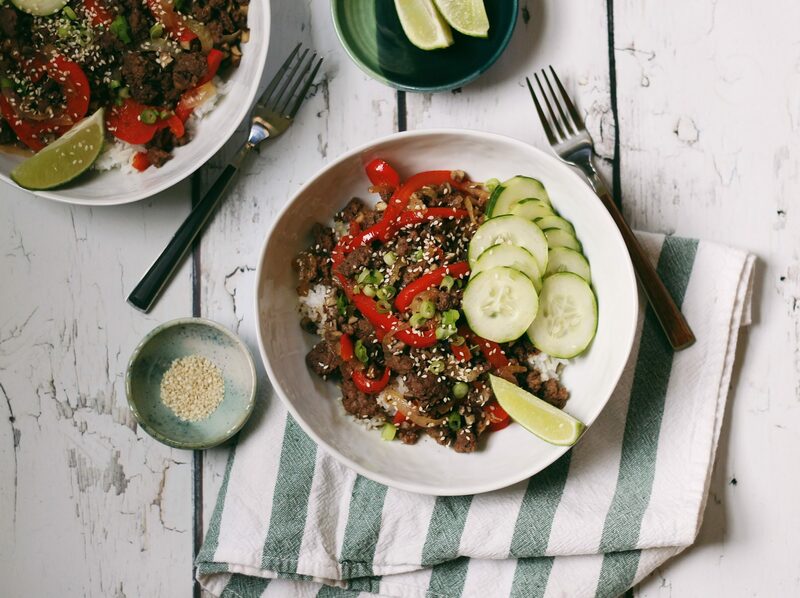 These Healthier Korean Beef Bowls are loaded with vegetables and laced in an addictive sweet-and-spicy sauce. They’re also incredibly easy, coming together in under 30 minutes start to finish. Heat one tablespoon of olive oil in a deep saute pan. When hot, saute the onions and cook until starting to brown. Add in the pepper slices, season with sea salt and pepper, and cook until just beginning to soften. Stir in the garlic. 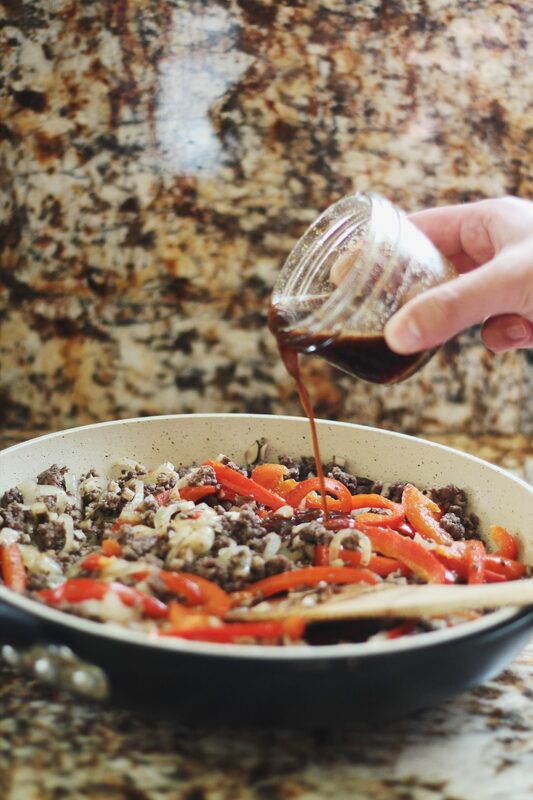 Push the vegetables to the sides of the pan and add the ground beef and chopped mushrooms to the center. Break up with a wooden spoon and cook until brown and caramelized. Drain excess fat. In a small bowl or mason jar, whisk together (or shake in a mason jar) the soy sauce, grated fresh ginger, sesame oil, brown sugar, honey, and crushed pepper. Pour the sauce over the beef mixture. Let the sauce and beef simmer for 1-2 minutes. 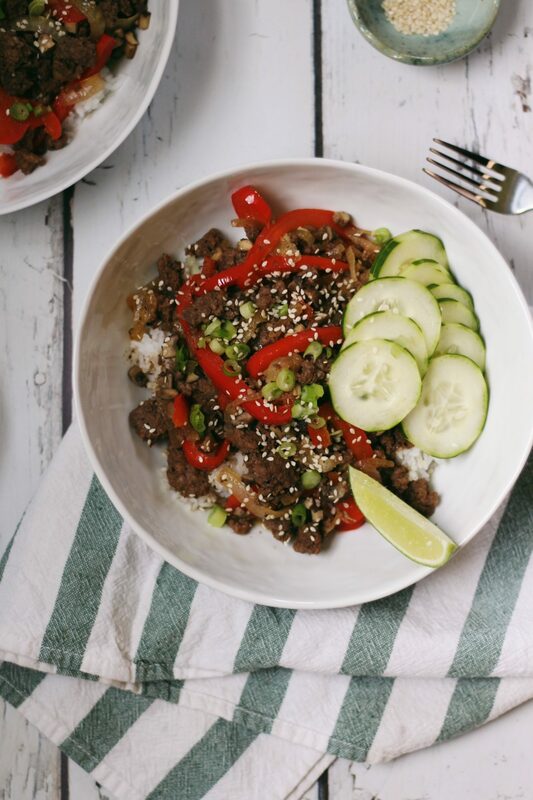 Serve the Korean beef over hot jasmine or brown rice and top with chopped scallions, sesame seeds, thinly sliced cucumber, and a generous squeeze of fresh lime. Enjoy! The think is living in South Korea, the beef bowls are very healthy. I don’t know why they aren’t in America. Wow, this Korean dish looks so delicious and look so easy to make. I will definitely try to make this for my family. Oh this looks and sounds so amazing. I will have to make this as soon as I can. This bowl looks so colorful and nutritious. I am currently not eating red meat but next month, I am all over this! 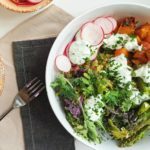 I LOVE the blenditarian concept, I’ve never heard it before, and I definitely want to start doing it, what a smart idea, and great way to get my kids to eat more veggies! Also, the beef bowl looks SO delicious! 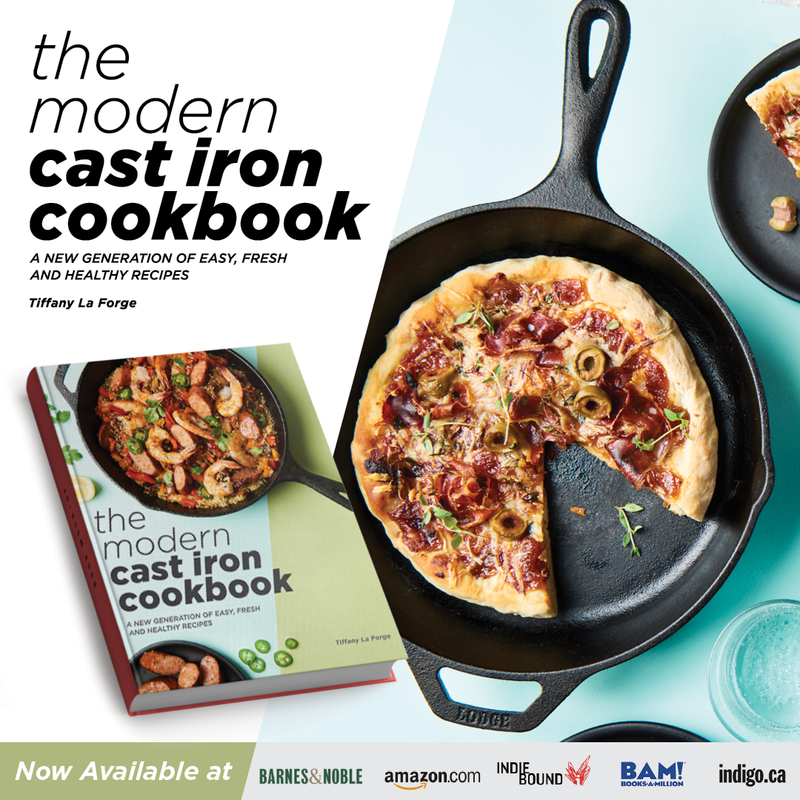 Can’t wait to try your recipe out! That sounds really delicious! Never tried Korean food! 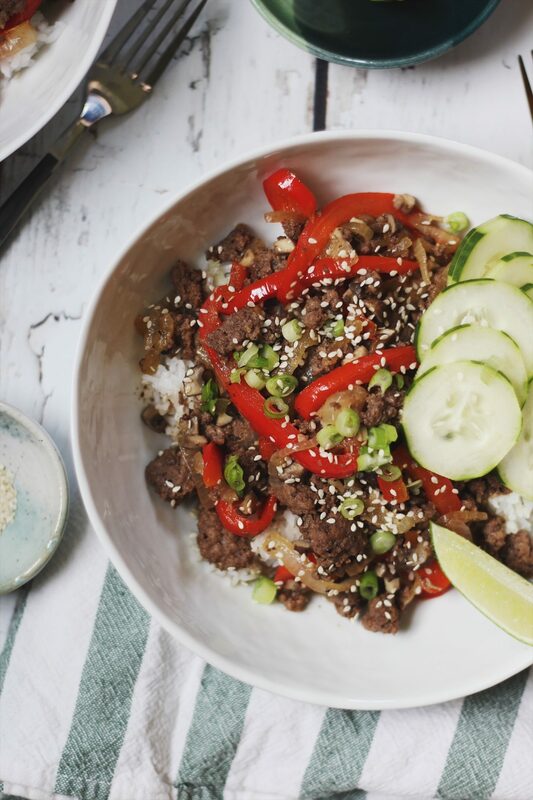 Wow, I have never tried to make Korean beef bowls and this recipe looks really delicious and easy. I will try to make this for my family, thanks for sharing! I love good Korean food! this has me so hungry with cravings now, espeically the sight of those veggies! That is one of the reasons why I loved Korean food because they make it sure that they really serve delicious and healthy foods. Oh yas!!! lovely! that looks so beautiful and now I’m craving for that beef bowl. 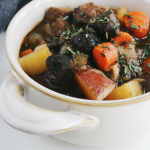 This is a wonderful recipe thanks for sharing! Yum! That does look like a lovely healthy, yet comforting bowl of Korean food. I can almost taste it. Mushrooms are my favourite, so I would definitely add those in. Looks nice! I like korean food, esp the real korean one (super hot!). Beef is my favorite when it comes for meat (no, actually second after horse) and beans are always welcome! Looks totally healthy and delicious!!! I will have to try this! This looks so delicious! I love Korean food but never really make it at home. Might just have to give this a try! This really sounds good and tasty but no beef for me. Thank you. That sounds so good! I love that you added in extra veggies for texture and extra vitamins. It really is a nice, healthier, complete meal. I can’t wait to make it.